Hadrian’s Wall, named after Roman Emperor Hadrian (117-138 AD), was built between 122 and 128 AD as the frontier fortification for the northernmost region of the Roman Empire, near what is the current border of England and Scotland. During their time on the island of Britain the Romans garrisoned the fortification with troops from various reaches of their empire including soldiers from North Africa. Although North Africans may have been at the Wall earlier, archaeologists now agree that there is compelling evidence that a 500-strong unit of Moors manned one of the forts along the Wall near the town of Carlisle in the 3rd century AD. Writing in the journal British Archaeology, Richard Benjamin describes a fourth century inscription discovered in Beaumont, two miles from the remains of the Aballava Fort along the western end of the Wall in Cumbria. The inscription refers to the "numerus of Aurelian Moors," a unit of North Africans, probably named after the Emperor Aurelius, who had earlier garrisoned the fort. This unit is also mentioned in the Notitia Dignitatum which is a Roman document that lists officials and dignitaries who visited the region. This unit of Moors as well as others were mustered in Roman provinces in North Africa and in adjacent lands such as Mauretania south of modern day Morocco, by the Emperor Septimus Severus (193-211 AD) who was himself a native of Libya. The Moors who arrived at the Wall in the 3rd century were battle tested since they had already fought for the Romans in present-day Germany and along the Danube, where there are other descriptions of the unit. Although the reasons for the construction of the Wall remain unclear, we do know that the men of the Second, Sixth, and Twentieth Legions constructed the Wall. Few men of these legions were Italian. Most were Spanish, Gallic, and German soldiers. Those who garrisoned the Wall for nearly three centuries were auxiliary units composed of non-citizens from throughout the Empire including the North African Moors. During the reign of Emperor Septimius Severus, other African-born Romans were active in Britain. Eight African men had positions of command in the northern Roman legions. Other Africans held high rank as equestrian officers. Most Africans, however, were ordinary soldiers or slaves in the Army or to wealthy Roman officials. Moreover, the racially mixed Roman military force did not treat all troops equally. Auxiliary troops were often positioned in the front during battles and thus most likely to suffer injury or death. 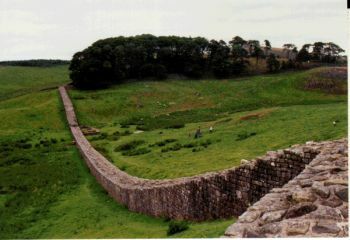 Nonetheless of the approximately 18,000 Roman soldiers stationed in Britain during the four centuries between 122 and 410 AD, when the Empire evacuated Britain, a small number of them were Africans by birth including those who stood guard and rebuilt sections of Hadrian’s Wall at the northwest edge of the vast Roman Empire. Richard Benjamin, “Whose Wall: Roman Wall, Barrier or Bond,” British Archaeology Magazine, Issue 77 (York: Council for British Archaeology, 2004); Anthony R. Birley, The African Emperor: Septimius Severus (London: B.T. Batsford Ltd.,1988); James L. Forde-Johnston, Hadrian's Wall (London: Michael Joseph, 1978); Alistair Moffat, The Wall (London: Birlinn Limited Press, 2008).